A momentous year for Roomex is coming to an end. A year that has seen us secure Series A funding, double our team, double our revenues and most importantly of all, provide an incredible hotel booking platform to some of the most respected companies throughout the UK and Ireland, helping them save time and money on their work-related hotel spend. The end of year also marks awards season and this year we have been busy, very busy. In the space of a week we have picked-up three of the most coveted awards in Irish business! Being recognised by industry peers always has particular value and so our award as Best Travel Technology Partner at the 2016 ITM Awards holds special significance. The judges commented on the rapid speed with which Roomex has scaled and the calibre of clients that we have secured both in Ireland and the UK in recent months. The awards comes at an opportune time as increasing numbers of leading TMCs now partner with Roomex to gain access to our wide selection of hotels with stronger pricing than they can achieve through their traditional channels. 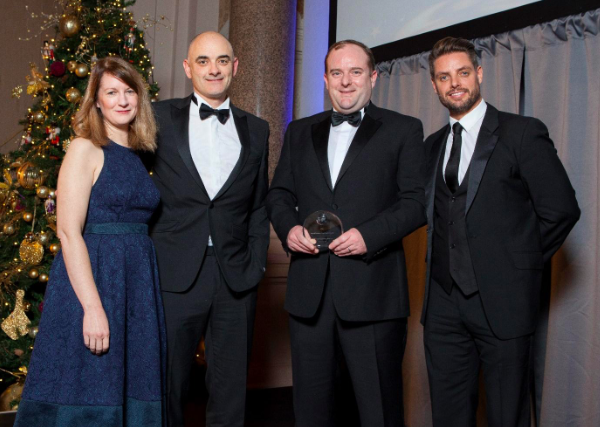 Pictured accepting the ITM Best Travel Technology Partner award is Olive Kavanagh, Director ITM Ireland, Michael Steele and Matt Sherlock (Roomex) and special guest Keith Duffy. 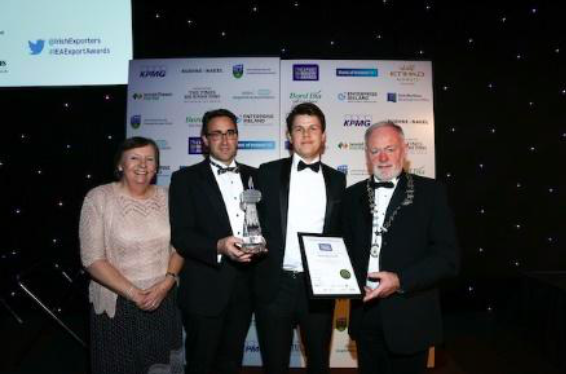 Our co-founders Jack and Karl were on hand to pick up the Services Exporter of the Year at the gala event held in Dublin’s Convention Centre. The awards acclaim all export industry sectors recognising emerging exporters as well as established indigenous exporters of manufactured goods and services. An esteemed panel of judges chose Roomex as the company whose export achievements in 2016, primarily our growth in the UK market, marked us out as the outstanding candidate for this prestigious award. Pictured are Mary Lambkin, Professor of Marketing, University College Dublin, Jack Donaghy, CEO, Roomex.com, Karl Glennon, CTO, Roomex.com and Paschal McCarthy, President, Irish Exporters Association. 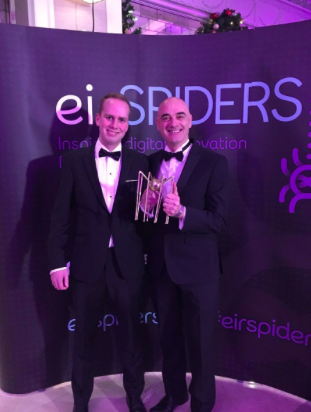 Established in 1996, the Eir Spiders are now in their 21st year making them the longest standing and most prestigious internet awards in Ireland. The awards covered 18 categories recognising outstanding achievement in a diverse range of digital categories. Roomex was delighted to be chosen as the Best in Travel, Sport, Leisure and Tourism. The judges recognised our ability to build a business around a digital concept, bringing business travel online, that comes very much from a pre-digital era. They expressed admiration for our rapid growth, client range and continued innovation. Pictured Niklas Ostros and Michael Steele from Roomex. And let’s not forget what happened in October! Roomex has once again been included in Ireland’s best known technology growth index – the Deloitte Fast 50 ranking – for the second year in a row and the fourth overall. The Deloitte Fast 50 measures Ireland’s fastest growing indigenous companies in the tech sector. The awards, which are in their seventeenth year in Ireland, recognise the contribution of tech companies to the overall economy. Cumulatively, the 2016 Fast 50 winners generated approximately €1.6 billion in total annual revenues in 2015. Roomex has been ranked 20th in Ireland in 2016 a massive leap from 45th position we secured in 2015. As always we are looking for new opportunities to demonstrate how our platform can save time and money on work-related hotel bookings. If you would like to learn more about how Roomex can help your business or if you would like to refer us to someone else please request a demo and one of our team will talk you through how Roomex can benefit your business. Finally, thank you to all the judges, organisers and fellow nominees across all categories and awards, your support and good wishes are very much appreciated.